When your brother is a wildlife biologist and you're in THE wildlife preserve of the world, what do you do? You invite him down, of course! Tony's wife and family are to be thanked for helping it happen on one week's notice. We picked Tony up at the airport on little Baltra Island (just north of Santa Cruz) where flights come in from mainland Ecuador daily. Our wildlife adventures began at the ferry crossing to Santa Cruz with a display of hundreds of blue-footed boobies and noddy terns roosting, wheeling, and feeding in the channel and along its banks. From the Academy Bay anchorage on Santa Cruz we took advantage of all the free sights and hikes. 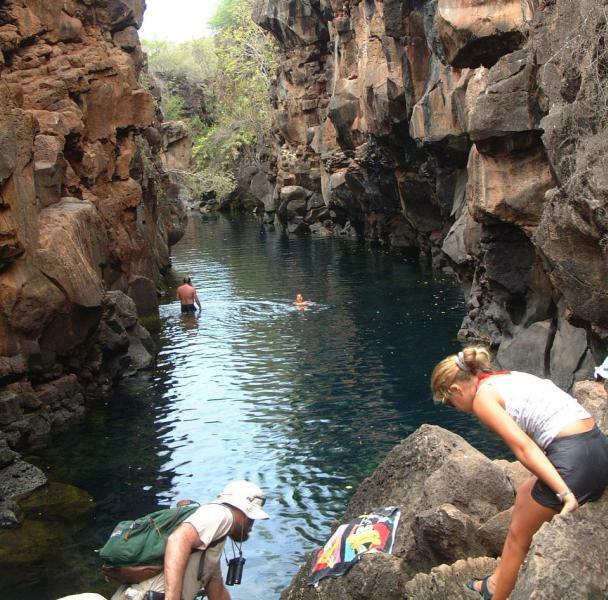 We found the trail to Las Grietas, a lava grotto with salt water which was refreshingly cool to swim in. With mask and snorkel we could see some unidentified fish which seem to inhabit the grotto. At a salt lagoon on the way we found a lone black-necked stilt. 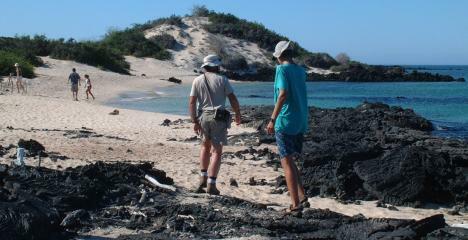 on the trail to Las Tortugas. On the trail we met our first lava lizards (male and bright red female), Galapagos mockingbirds, Darwin finches, and yellow warblers. Out by the sea we found black lava gulls, marine iguanas, Sally Lightfoot crabs, and a striated heron feeding on the rocks. At the salt lagoon we saw a great blue heron. 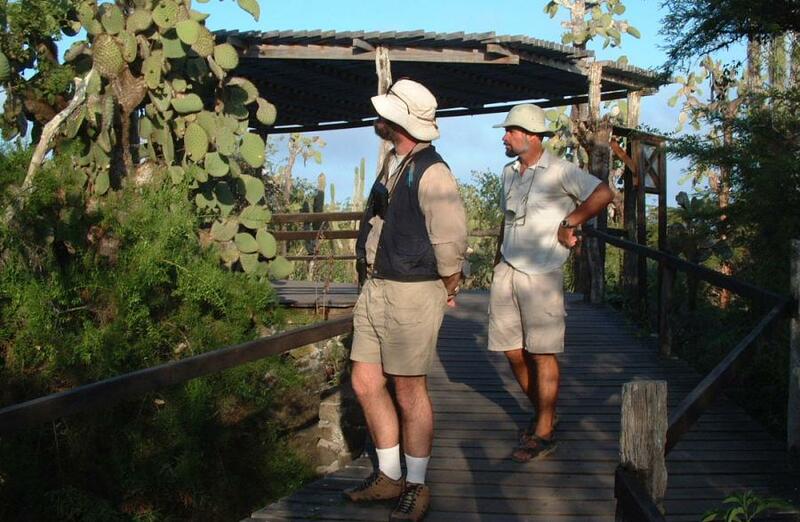 The flora was interesting too, with Galapagos cotton (we saw the cotton balls, and then the large flowers, but didn't learn until later that it's an endemic plant), prickly pear cacti, candelabra cacti, and the bare Palo Santo trees. We spent a few days in Puerto Ayora arranging for a tour boat. We did a lot of shopping for a tour with an itinerary that made sense: i.e. went to the most places with the most diverse wildlife that we couldn't see from our own boat, combined with a reasonable price. 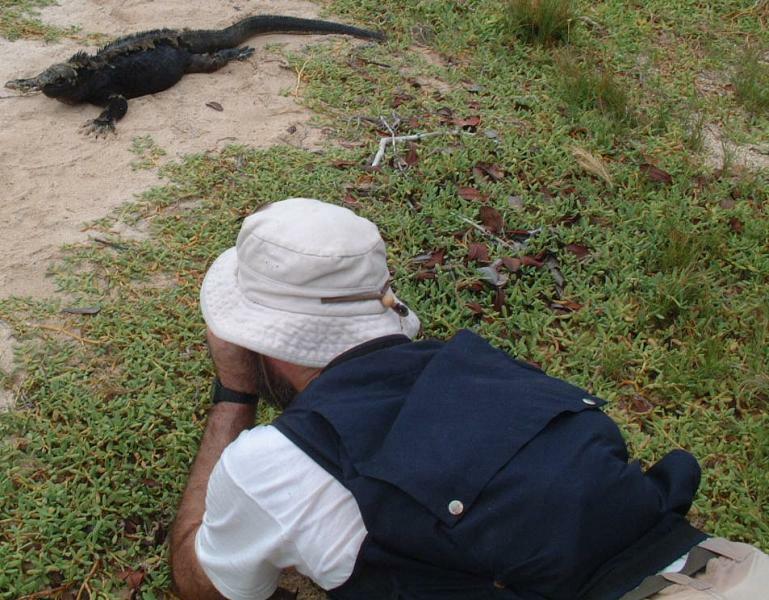 We were sure glad we hadn't booked a tour from the USA or even mainland Ecuador! The walk-up prices are by far the best deal. You just have to have the time to hang out in Puerto Ayora for a few days to make the arrangements. Lobo de Mar had the best deal for us ($250 per person, plus tips) for a four-day tour with a bonus fifth day to the highlands and wild tortoise area of Santa Cruz. Life on Lobo de Mar with Tony, two young couples from Europe, our naturalist guide Rodrigo, and a crew to feed and serve us was deliciously decadent! 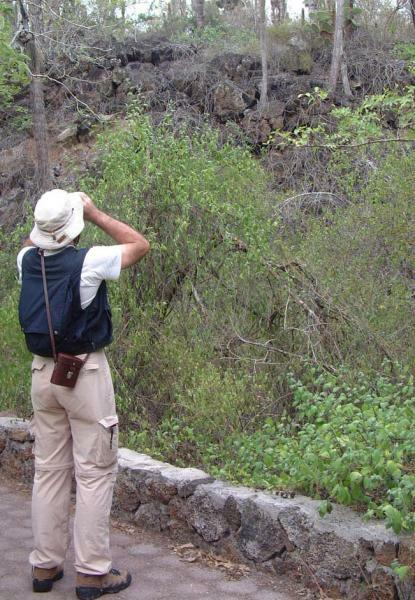 Tony and Sue spent hours studying the nature and bird guides that we had brought, and that Rodrigo used to prepare for his talks. Having our "own" wildlife biologist on the trip meant lots of great conversation about the ecology, the animals, the plants, and the human impact on the Galapagos. Although sometimes it seemed that Tony may have known more than our guide, he was good-natured about it, inquisitive, and always interested in learning. In fact, Tony was fired up to return to the Galapagos as part of a scientific team or as a guide. In addition to our time on Lobo de Mar, it was great having Tony on Ocelot with us again. He was always the first up in the morning and we could find him in the cockpit sipping hot tea, binoculars at the ready for some from-the-boat birding. Around Academy Bay, Santa Cruz, we had constant fun with the sea lions barking and playing in the water and on the sterns of the power boats, pelicans perching on boat rails, magnificent frigate birds soaring above us, and noddies, gulls, egrets, and herons taking flight from the shoreline. We used to have a "Photo Gallery" here - a collection of pictures from out trip with Tony - but it didn't display correctly in some browsers, so we've replaced it with our simpler photo display. As normal, clicking on a picture will give you to a larger version. When lava flows from a volcano, the outer layer often cools and hardens while the interior remains molten. Sometimes the molten interior flows out entirely, leaving behind a hollow "lava tube". Some of these tubes can be several miles long, but most are much shorter. Entrance is usually gained when part of the tube collapses. 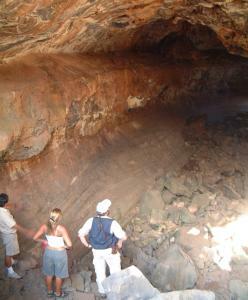 Las Grietas, on the left, was probably formed by a lava tube which collapsed, leaving a smooth, deep floor. It has an opening to the sea, and some fish inhabiting the cool (and mostly fresh) waters. Lava tubes are found on many of the islands, due to the volcanic origin of the Galapagos. The most accessible were on Santa Cruz. The one on the right is just off the main road to the airport, and is free to enter as it is part of the National Park. Some tubes are a few thousand meters long, but must be entered on private land for a small fee. No lights were needed in this one, because it had collapsed at the ends, making it possible to walk through. 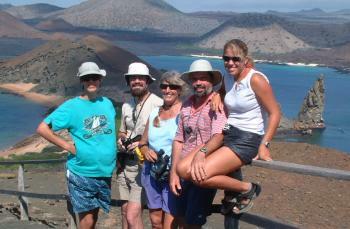 at the Darwin Center on Santa Cruz Island. Most of the main Galapagos Islands have a "Darwin Center" which is open to the public daily, for free. We visited all of them that we could. At the centers we saw many birds including Darwin finches, Galapagos mockingbirds, the smooth-billed ani, and the dark-billed cuckoo. Each of the three Darwin Centers we visited also raises giant tortoises in an effort to bring these beautiful creatures back from the brink of extinction. They incubate the eggs of their captive females. Since gender is determined by the temperature of the eggs, the centers can adjust the incubation temperature to produce more females than males, to more quickly build up the populations. Tony is second from the left, in the back. Since each island has their own race of tortoise, they keep track of the animals in order to keep the populations genetically as pure as possible (some intermingling has already occurred, and some islands were completely wiped out). Mature tortoises are brought from all the islands and kept in separate areas to avoid interbreeding. The young ones are released back to the wild on their own islands when they're old enough to survive on their own. On the Lobo de Mar tour we had two excursions ashore each day. 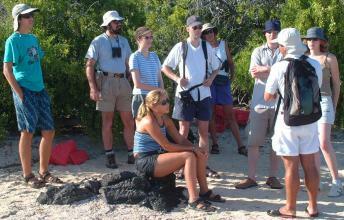 Rodrigo, our wildlife biologist, always assembled us for a mini-lecture on the beach or trail. Yes, it was hot on the beaches in the sun, but hats and shade from the shrubs helped. Tony probably had more classical education as a wildlife biologist, but Rodrigo knew more about the local Galapagos flora and fauna. Their discussions were very interesting, each learning to respect the other. Tony, center, and Chris on the white sand beach at Sullivan Bay. After our beach lecture Rodrigo would lead us on a guided walk for an hour or so. Then we usually went for a quick snorkel, but the water was so cold that we couldn't stay in for much longer than 20 minutes, even with wetsuits. 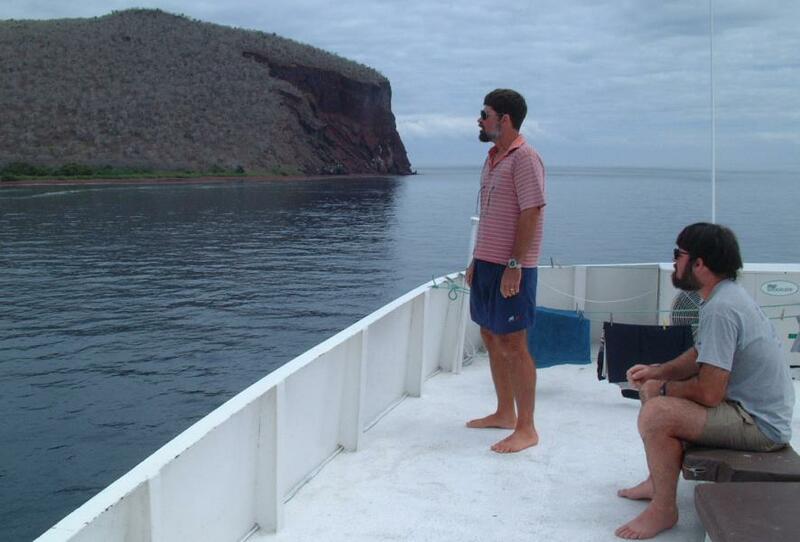 Then we'd go back to Lobo del Mar for hot showers and lunch while the crew moved us to another anchorage. After an afternoon siesta (a most civilized tradition) we'd do it all again. After a morning at Bartolome Island, we took the panga (dinghy) across to Santiago Island for some lava field walking in the blistering sun. We ended at beautiful Sullivan Bay beach (left) for a refreshing (cold!) swim with the sea lions. 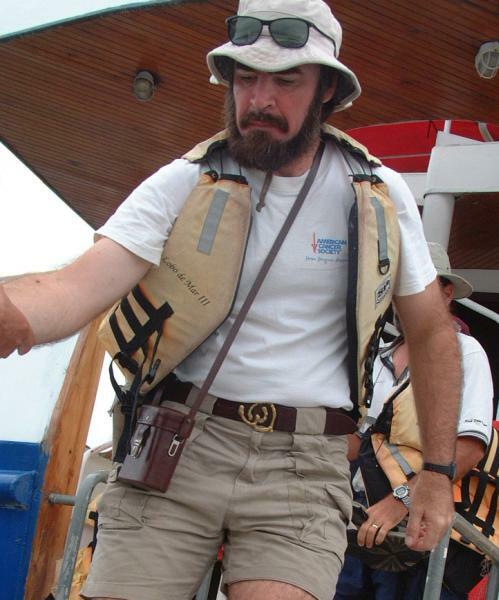 moment aboard Lobo de Mar.